As a lot of you are probably aware there was a little show last week in London called SES, over the 3 days over 2000 people attended and I was very busy speaking on 5 sessions. Overall the event was a great success with a lot of positive vibes around the attendees that I spoke to before and after sessions. The content was great across the board with strong speakers and my fellow Geordie Mike Grehan at the helm as Chair of the London SES event. On Day 2 I had two sessions one as a speaker and one as moderator. First up was "Landing Page Testing and Tuning" which turned out to be a great session with good attendance and great Q+A. There was some blog coverage here to give you an idea of the session content. 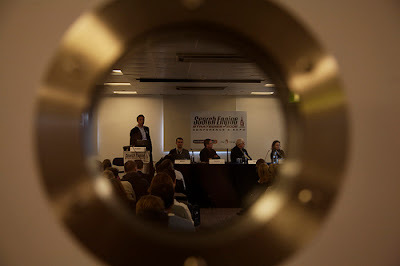 I also came across a really nice arty picture of the panel in action posted by Greg Jaboe on Search Engine Watch see if you can spot me! In the afternoon I moderated the "Searcher Behaviour Research Update" this was reference prior to the SES event as one of the "7 Reasons to attend London SES" and the attendance did not disappoint the room was full. Thanks to the panelists Erica, Rob, John and Piers for some great insight and content. It was a great but busy 3 days all in all and I am looking forward to getting the customary SES session scores back from the attendee surveys. Microsoft bids $44.6 billion for Yahoo!!! Google Street View.....New Beta Test Option?